Tag Archive | "European Council"
This blog post is the first in a series of three where I will be exploring the forthcoming changes of the European Human Rights system. In this post I intend to give an overview of the European Union. The second blog post will focus on the European Convention on Human Rights. Both these posts will lay the foundation for the third blog post, where the EU’s accession to the European Convention of Human Rights will be discussed. After the Second World War, the nations of Europe saw regional cooperation as a key for avoiding further wars. Out of the ashes of war two international organizations were set up; the Council of Europe and the European Coal and Steel Community. The former exists to this day, and is the parent organization of the European Court of Human Rights. The latter was the first building block of the European Union. The European Union is, at its heart, an international organization. However, in contrast to traditional international organizations, which are generally a form of institutionalized inter-governmental cooperation, the European Union has a much larger autonomy.1 The EU has also been conferred considerable powers from the member states. These powers are mainly exercised through the Unions’ four primary organs. The Commission is the Unions executive organ. It consists of 27 commissioners – one from each member state – sitting in their private capacity. The Commissions primary tasks is suggesting new legislation, enforcing legislation existing, and representing the EU externally. The third body worth mentioning is the Council. It consists of representatives from the member states, and has the final word on EU legislation and international agreements between the Union and non-member states. It also approves the budget and coordinate the economic, foreign and defense policies. Votes in the Council are weighed according to the size of the countries, and binding legislation may be passed without necessarily requiring unanimity. Even though the council resembles the main organs in other international organizations, it differs by being able to pass binding legislation upon member states without unanimous consent. Finally we have the Parliament. It consists of several hundred members directly elected by nationals of the member states. It is supposed to provide democracy to the Union. However, few people care about, or even participate in, the European Parliament elections. In addition, there are no parties in the traditional sense, but rather coalitions of similar national parties. If one adds that the parliaments limited powers to the mix, one can easily see that the democratic alibi of the Union is lacking in accountability and effectiveness. However, since the Lisbon Treaty entered into force in 2009, the Parliaments powers when passing legislation has increased somewhat. While the legislative power in the end rests with the Council, the procedure today has a larger degree of cooperation built into it. This jurisprudence has in turn been accepted by virtually all national courts. Thus, implementing measures by individual member states are not necessarily needed for citizens to be able to rely on EU law before national courts. Since EU law may also be used to annul national legislation it has a sting to it that’s unmatched by other international organizations. 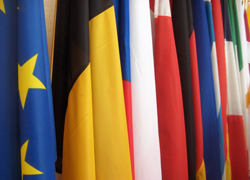 When creating and interpreting the EU concept of human rights the ECJ was inspired by both national constitutional traditions and international conventions. Especially the European Convention of Human Rights was held in high regard. At the turn of the millennium the EU also proclaimed its own Charter of Fundamental Rights, which finally became legally binding through the Lisbon treaty in 2009. But, as we shall see in my upcoming articles, the EU concept of Human Rights had its limits. Before we can investigate these limitations in detail a brief examination of the European Convention of Human Rights, and its system of enforcement, is necessary. That will be the subject of the next article. Stian Øby Johansen is from Norway, and works as a Research Assistant at the Centre for European Law at the University of Oslo. He is currently writing his Master thesis on the European Union’s forthcoming accession to the European Convention on Human Rights.